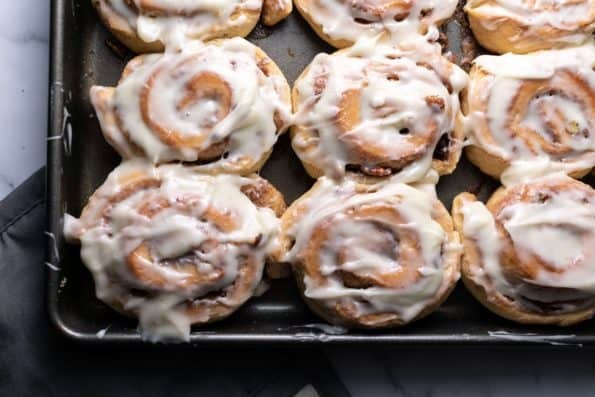 Cream Cheese Frosted Cinnamon Rolls are big fluffy rolls filled with cinnamon sugar & pecan goodness, oozing with frosting and soft all the way through, made to make any holiday morning or weekend brunch extremely special. I’ve been embracing a lot of new change lately. I started a new job two weeks ago which has been going great – but change is a lot to handle sometimes even if its good change. Another change is that this Christmas is our first as a married couple, which is a really happy change! We’re spending it with my family on Long Island this year, a new thing for my husband. One tradition we both have is enjoying homemade cinnamon rolls while opening presents. I promised to absolutely have these for him to ease into the change of spending Christmas away from his family. Its really sweet that we have such a small detail of our family’s Christmas morning that’s totally the same! I usually follow a pretty simple recipe for cinnamon rolls and modify to my own liking, so it was time to really put my recipe in writing. I’ve been making these same cinnamon rolls for years now and they are always a hit. I mean, who doesn’t love the excuse to essentially eat dessert for breakfast? 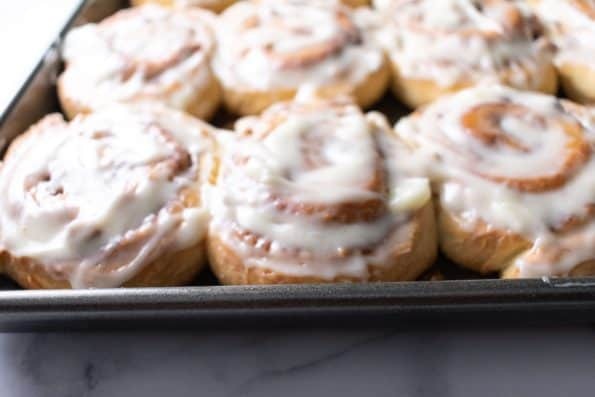 I used to love waking up to the smell of my mom making the Pillsbury cinnamon rolls! This recipe is always a no fail for me. It’s straightforward & comes out fantastic every time. Warning: I like my cinnamon rolls sticky, loaded with cinnamon sugar, and to not feel like I’m just eating a bread roll. I want the whole roll to taste like the MIDDLE of the roll. So if you don’t agree with that, these may not be for you! And can we just talk for a minute about Cinnabon? It takes all my willpower to not get one in the mall or at a rest stop along the parkway. They taste amazing – but for 1,000 calories? 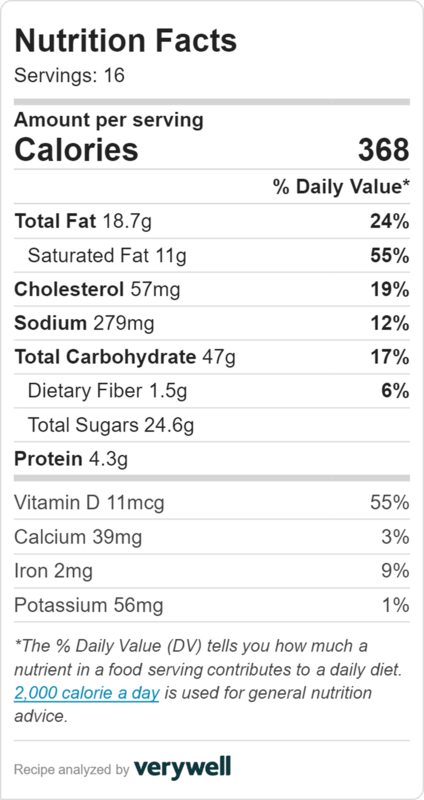 (Yes, that’s really straight from their nutritional info!) That’s like two meals, not a snack…unless I really want to cheat on my diet! 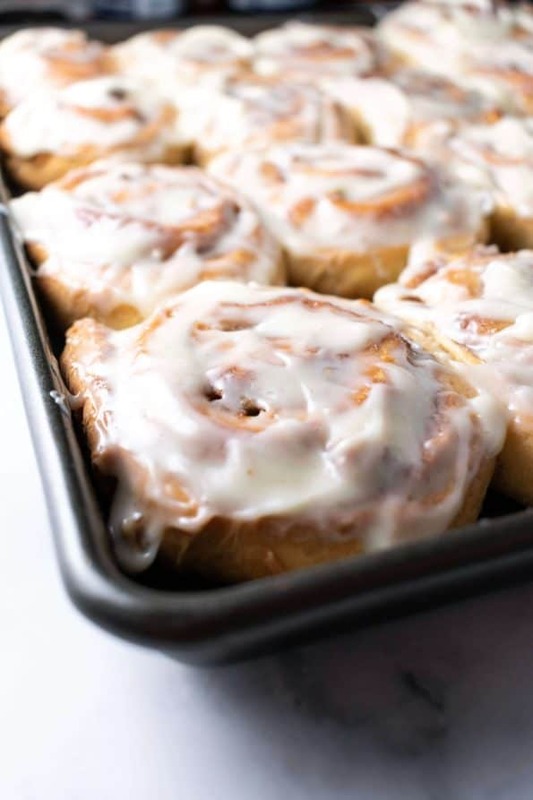 So now, picture waking up on Christmas or any special occasion, or uh, any given day, to the smell of Cinnabon coming out of your kitchen. Yep. Sold. Let’s do it. Yeast needs to be reactivated to make the dough rise. Some instant yeast can be mixed directly into your dough and others need to sit in warm water for a few minutes. Sugar can also be used to double check that your yeast is alive and will make your dough rise since sugar is what yeast feeds off of in your recipe to expend CO2 and make dough rise. Adding sugar isn’t totally necessary, BUT I have had a few odd occurrences where my dough didn’t rise and its worth finding this out now, before going any further into the recipe! Adding a teaspoon of sugar to the warm water and yeast will tell you in under 2 minutes if your yeast is alive or not. Active yeast will start to bubble and rise if there’s sugar in your water. If your dough is dense, crumbly, hard, and still not rising after 45 minutes – the problem is your yeast. The dough should be soft, pliable, and continue rising. Activate yeast in a small bowl of warm water & sugar. Set aside for about 15 minutes, it should be bubbling. Heat milk in a small saucepan on the stove and turn off just before it boils. Mix constantly (do not burn!). Add melted butter, egg, and salt and whisk until smooth. Add in 2 cups of flour and mix until smooth. Add in yeast. Mix in remaining flour, ½ cup at a time, until dough is soft and easy to handle. Knead for 5-10 minutes. Place in a large greased bowl and let rise for 1 ½ hours. Once the dough has doubled, punch it down on a well-floured surface. Knead and gently stretch out to a large rectangle, about 15 x 9. Brush melted butter all over the dough. Mix together the cinnamon and sugar. Sprinkle all over dough, saving 2 tbsp for later. Spread pecan pieces all over top. Starting with the side closest to you, start rolling the dough into a log. Continue tucking it into itself, leaving seam on the bottom. Pinch the ends together to secure. Using a sharp knife or floss, slice into 1” rolls. Grease pan with butter and place cinnamon rolls in pan, they should be touching. (The closer the rolls, the softer all the edges will turn out, the more space in between, the more "toasted" the outside of the rolls will get). Sprinkle the remaining cinnamon sugar all over the top of rolls. (If you’re making them for the following morning, stop now, cover and place in refrigerator). Cover with a kitchen cloth and let rise again for 1 hour, or until they've risen. Heat oven to 350. 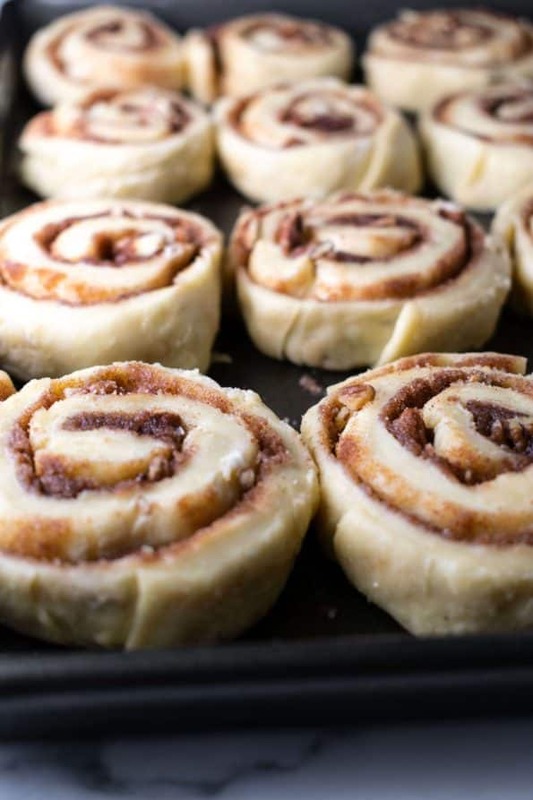 Bake cinnamon rolls for 30 minutes or until browned. Meanwhile, to make frosting, beat together the butter and cream cheese until smooth. Reduce speed to low and add in confectioners sugar ½ cup at a time. Add in vanilla extract and beat everything together. 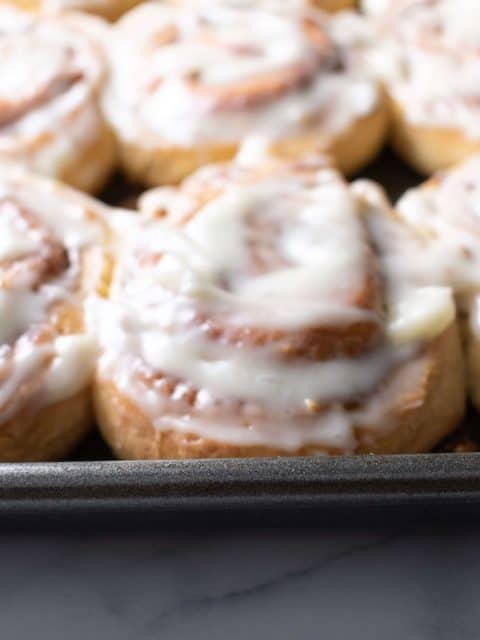 Let rolls cool a bit before frosting & enjoy! To store leftover rolls in case you don't eat this all in ONE sitting...tightly cover unfrosted rolls in plastic wrap or an air tight container and refrigerate.